Like other M-Force models, the Orient Automatic Men’s Watch also features an ISO-standard water resistance (200 meters) and special shock-absorbing structure, which makes it ideal for scuba diving. Titanium being very light, it enhances the wearability of the watch dramatically. 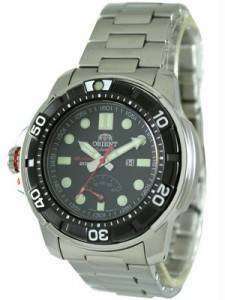 If you find the Orient Automatic Diving Sport Men’s Watch a bit too much to handle, a safer choice would be the M-Force Beast. This one is Orient’s next most-serious dive-watch option. The in-house movement of the Beast is more sophisticated (22-jewel, caliber 40N5A, 21,600 beats/hour; features date, power reserve, manual winding and hacking) than what they use in their usual dive watches and this one too comes with an ISO 6425 certification. The diving community addresses the M-Force Beast as a diver’s dive watch.